Maryland Gov. Larry Hogan joined “The Terminator” — former California Gov. Arnold Schwarzenegger — to hear twin cases on redistricting being heard at the U.S. Supreme Court. After oral arguments in two redistricting cases — one from North Carolina, one from Maryland — the two talked to reporters outside the court building. Both said the problem of drawing districts to give advantage to one party or another — a practice known as gerrymandering — is a bipartisan one. “This is happening in Republican states — Republicans do it, and in Democratic states, Democrats do it — and the more they gain control, the more they do it,” Hogan said. He compared the problem with a snowball rolling down a mountain, gaining mass and speed as it travels. Schwarzenegger said frustrated voters, who find that their votes don’t count in a district drawn to give power to the opposing party, sometimes look for an outsider — as Californians did when they voted for him, he said. “But that’s not the only answer. 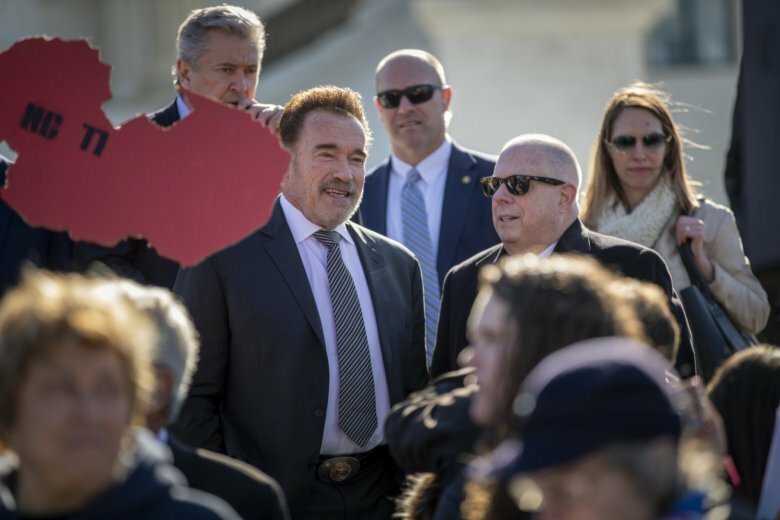 The answer really is to deal with redistricting, and with the gerrymandering issue, and to terminate gerrymandering once and for all,” Schwarzenegger said, with a nod to his iconic movie role. The Maryland case, Lamone v. Benisek, centered on the argument that Republican voters in Maryland’s 6th Congressional District were deprived of their First Amendment rights when state lawmakers redrew that district in order to give Democrats an advantage in elections. The district was drawn so that it stretched from the far western corner of Maryland into the D.C. suburbs. John T. Willis, a former Maryland secretary of state under Democratic Gov. Parris Glendening, who served from 1995-2003, said that gerrymandering is a national problem but that Maryland’s 6th District doesn’t serve as a good example of the practice. Willis, now a professor at the College of Public Affairs at the University of Baltimore, argued that results — outside of congressional elections — show that the 6th is competitive, and points out that Hogan won the district. The issue has taken on new urgency, since congressional districts are redrawn after each census. The next one will be conducted next year. The Supreme Court could issue an opinion on the case any before the end of the term in late June.